Our objective, in financial planning, is to provide a means to determine the potential financial returns from adding an infusion therapy practice to an existing medical practice. It is deliberately not our intention to provide a basis for modeling an entire practice as, through considerable investment in people and facilities, you have likely already hurdled the cost of establishing your practice. 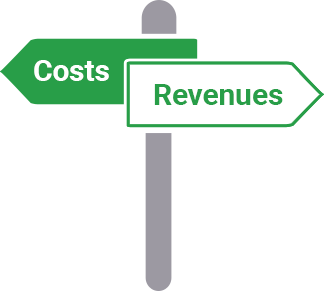 Accordingly, capital and startup costs are limited to the incremental costs of infusion therapy equipment and other startup costs, plus the marginal revenues and costs associated with just an infusion therapy service offering. By entering your assumptions for these values into the Microsoft Excel spreadsheet linked below, it is our expectation that you will be able to discover and visualize: your costs, profits, and Return on Investment (ROI) from expanding your patient services to include infusions. Ultimately, our goal is to ensure your financial understanding and confidence in delivering infusion services, should you make the decision to expand your practice in this manner, and having conducted the appropriate legwork such that all necessary regulations are followed. The tables provided in the Excel link enable you to download and develop a high-level financial plan for your infusion services using prices you have negotiated with payers, as well as costs that may be anticipated when administering IV steroids and/or IV therapies for primary immunodeficiencies and asthma. Disclaimer:The infusion toolkit financial model is provided for illustration purposes only. It is not intended to predict the financial results or return you can expect. Like all financial models, it includes certain assumptions, which may or may not be representative of the costs and revenues you will experience. In deciding whether or not to invest in an infusion therapy practice, you are advised to seek professional advice from a Certified Public Accountant or other financial advisor. Moreover, ACHL specifically disclaims any responsibility for any financial loss you may incur, as a result of your decision to invest in an infusion therapy practice. There are several tabs in the worksheet linked above. All of these worksheets can help you customize your financial plan to match your real-world cash flow (revenue minus expenses). Other than the first worksheet entitled Summary Financials and a later worksheet entitled All Treatments by Month, each worksheet in the workbook contains Input cells, colored in light orange, that store planning assumptions. All worksheets in the workbook are interactive, which means a change in any assumption will update all related cell values in the workbook. An initial set of assumptions has been entered for illustration purposes. As you change each assumption to reflect your circumstances, the effect of your change will flow through the two-year projection of expected financial results on the Summary Financials worksheet. The Summary Financials worksheet also includes a graphical representation of monthly cash flow, including a projected break-even month and ROI calculation. Any earnings past the break-even point represents cash returned to you that is greater than your Startup Investment. The workbook provides you with the ability to model investment in up to three infusion Treatment Setups and three different infusion Treatments. All Setup and Treatment assumptions are independent of each other. Both the cost of Capital Equipment and Additional Startup Costs must be funded in cash before an infusion therapy service can be offered; both are considered part of your Startup Investment and compose the denominator in your ROI computation. The cost of Capital Equipment is depreciated in the determination of accounting earnings and taxable income. Since Depreciation is a non-cash charge against Income, it must be added back in determining Cash Flow, the numerator in your ROI calculation. Additional Startup costs are expensed as incurred. Inventory replenishment is funded from drug sales Income. The Recurring Annual Costs Input cells provide you with the ability to include one or more annual costs (i.e., costs not incurred every month) such as equipment calibration, in your financial planning model. Recurring Annual Costs are assumed to occur in Month 12 and 24 of plan Year 1 and 2, respectively. If you expect more than one type of Recurring Annual Cost simply ensure its cost is included in the value entered in these Input cells. As mentioned above, all Treatment assumptions are independent of each other and spreadsheet Inputs are available to model up to three Treatments. The Input cells on this worksheet are where you should enter your negotiated patient prices from payers and negotiated costs from suppliers, plus the expected cost of clinician labor and time spent in the direct delivery of infusion therapy services. For immediate feedback on your assumptions, margin calculations are provided for each modeled Drug and Service. The next four worksheets in the financial plan contain the monthly data underlying the two-year projection on the lead worksheet: Summary Financials. The first worksheet, All Treatments by Month, simply represents an accumulation of the next three labeled Treatment # by Month. All that is necessary from you is to enter your expected patient volume by month, for each of the (up to) three Treatments you intend to offer. No direct Inputs to the All Treatments by Month worksheet are necessary. For each Treatment, the Price to Patient and Cost of Drug and Service to Practice are calculated, by month, using Inputs entered on the Drug and Service Assumptions worksheet. At the bottom of each worksheet in the workbook are a set of notes which outline (but are not all-encompassing) some of the global assumptions which have been made in order to generate a model of projected costs and revenues. It is important for you, the user, to consider all other factors which may be specific to your practice and which ultimately will impact your costs and profit. Practice Pearl: No two payers use the same coding and billing procedures for infusions, so it is up to you, the clinician, to determine which codes and billing procedures are best to use for your practice. Not only that, NEGOTIATE directly with payers to maximize the amount of reimbursement you will receive for in-office infusions. Greg Bensch, MD. AAAAI 2017 symposium. Atlanta, GA.